Cuba possesses beautiful places where its visitor propitiated mainly by the warm climate that offers its geographical location. Today at NosotrosCubaneamos we want to share some data from the best caves in Cuba. Caves are places where Cuban history (since you can find aboriginal pictographs), and nature (lakes and animal varieties) converge. Classified by some as the natural swimming pool near Varadero, it is a beautiful cave where you can take your snorkel and enjoy a magnificent bath. Its natural pool has a depth of 20 meters, where you can find fish and other native species of Cuban aquatic fauna that inhabits the groundwater. It is full of stalactites and stalagmites. The presence of submerged stalagmites suggests that this cave was not always flooded by water. There is an area with spaces for eating or drinking coffee very close to the entrance of the cave. 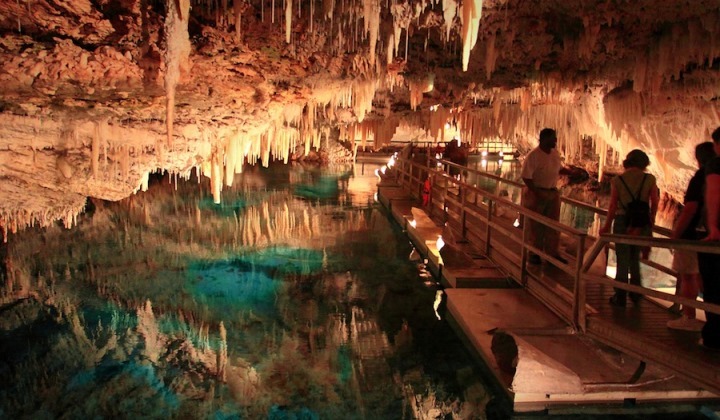 Set of caverns with more than 23 kilometers of galleries located in Matanzas. These caves were declared a national monument not only for their beauty, but for the important paleontological findings and the wide range of crystalline processes. While they remained below sea level, these caverns were full of water. The tectonic movements caused the area to rise, to the point of forming the marine terraces that can be seen in the city of Matanzas and its surroundings. They were discovered thanks to the loss of a bar by a slave in February 1861. The slave and the foreman imagined that the earth had swallowed the bar. The owner of the farm went to the place of the events, and ordered that it be dug from where a great current of disgusting air of smell; hot and as smoky. This gentleman, who was knowledgeable about mines and caves, prepared the cave so that his visitors could enjoy it. They took out many stones; they made masonry stairs that are still in use; they installed handrails; and as soon as it was a reality, he installed electric light. 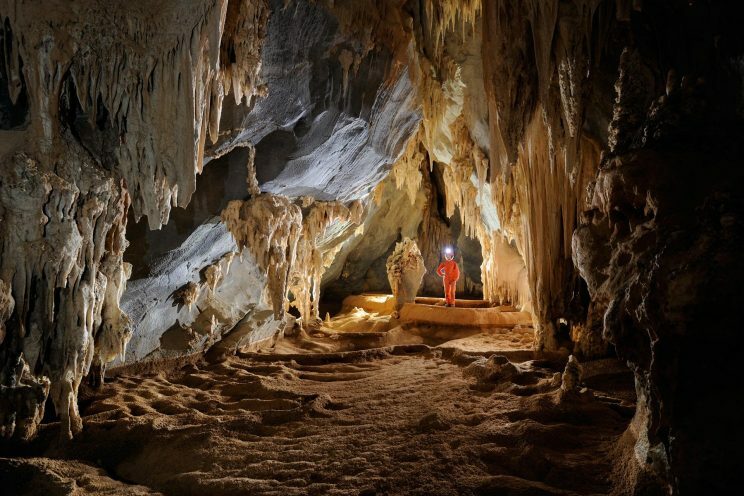 The cave has four sectors, galleries and halls that are upholstered with stalactites, stalagmites and helictites, the latter of capricious horizontal shapes. It is located 20 km from Viñales in the Sierra de Quemados, Los Órganos, in the Province of Pinar del Río. Its galleries measure around 5199 meters. Its name comes from the Santo Tomás River, since its galleries were originated by several rivers, currently named Santo Tomás River. It has more than 46 km, including eight levels. 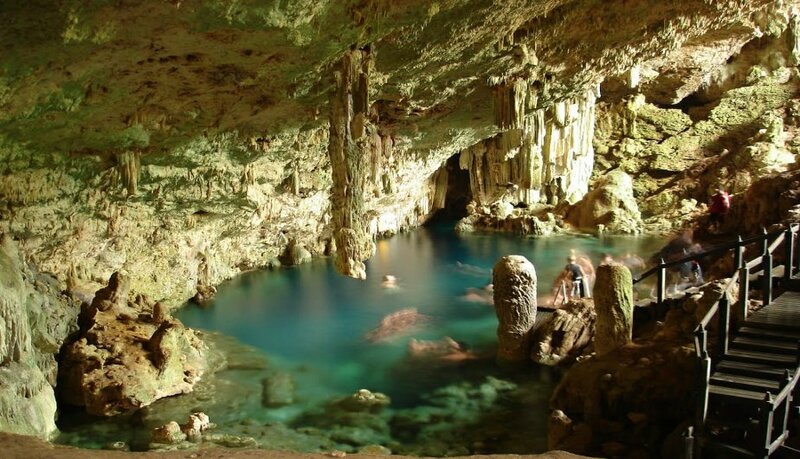 Considered as the largest cave system in Cuba, Central America, the Antilles and South America. From the historical point of view it shows its footprints through an Indian mural and it was one of the main settlements of maroons fleeing the sugarcane plantations. This cave is made up of aquifers, many formations of stalactites and stalagmites, as well as different rocky accidents, which adds a peculiar beauty to the place. The investigations on this cave began in 1954 by the Speleological Society of Cuba. The open caves in the Sierra de Quemado, were only known until then by the peasants of the region in some of their initial mouths and galleries. The inhabitants of the Quemado Valley visited the Cueva del Salón, named after the place where they held their celebrations. They were also used to extract bat guano to fertilize the vegas of tobacco. The waters of the pocetas were also an important source in the sowing when the Santo Tomas stream passed through a period of drought. It is one of the most visited caves because it is much more accessible located in the Viñales Valley. It is equipped for contemplation, although only one kilometer of its extension can be visited. The journey through the interior of the cave begins on foot along an artificially illuminated path that reveals the wide and rich repertoire of stalactites and stalagmites that have formed over the years. 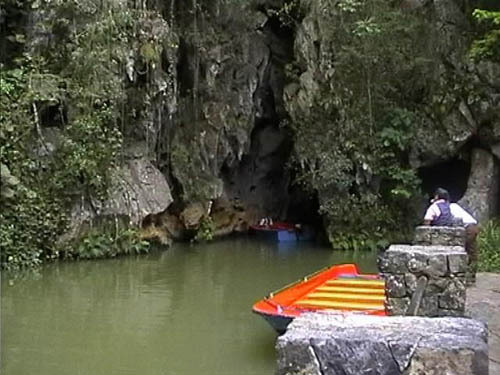 It can be visited later through the San Vicente River in a small boat that sails inside the cave. The place is located just 5 and a half kilometers from the town. This cave was a refuge for the aborigines who filled their walls with cave drawings still preserved today and which make the place a place of great popularity for national and foreign tourists who enjoy an encounter with the oldest Cuban history. Hola.n voy pa Cuba Junio. Quciera saber que excursion se ouede hacer para Junio 4 oa vinales y junio 5 para Una Cueva ..cuanto cuesta para un gupo de 8 4 adultos y cuayro ninos. Hola Janeth, puedes seleccionar la excursión que desees a través de la página de reserva. Sobre precios consulta las páginas https://nosotroscubaneamos.com/excursiones/ y https://nosotroscubaneamos.com/excursiones/vinales/. Geikis estoy por viajar a Cuba por favor quisiera contactarme contigo. Soy de Lima Perú. Excelente imágenes. Saludos desde Argentina!